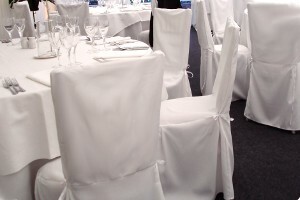 Transform your event with chair covers for hire from only £2.15. 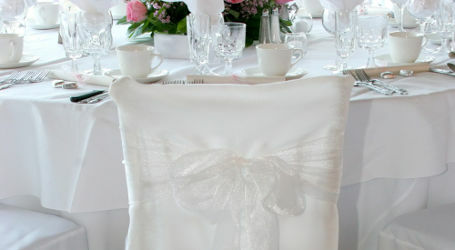 Your luxury fitted chair dressings, chair bows and chair sashes can be hired with or without a marquee. Made to measure covers which refresh dated chairs. Tailored skirt back pleating for elegance. Available in white, black and a range of other colours. We ensure that you receive a superior hire service. All of your linen is cleaned before each booking. Each item is individually hand ironed. The items are personally delivered and collected. 1. Full Service – Save time and hassle. Take the stress out of a time consuming job. Our team will dress your seating letting you focus on your event. 2. D.I.Y. Service – Do it yourself and save money. If you’re on a budget the ideal option is to select the D.I.Y service. To fit 100 chair covers takes 4 people approximately 1 hour. You can order by phone or Get Your Quote Here and we will arrange your order. We will deliver your order the day before your event or, if you are using the full service our team will supply and fit at your venue. Once your event is finished simply place all the used items in our collection bags. Used items will be collected at a conveniently arranged time after your event. Get Your Quote Here on your chair covers for hire. We also stock a range of other items such as chairs for hire and table linen hire. Coventry, Birmingham, Derbyshire, Nottinghamshire, Northamptonshire, Warwickshire, Leicestershire, Rutlands, Solihull any many others. Contact us to check availability if you fall outside of the above areas. Everything we offer above is also available to buy, if you require purchase prices on any of the items listed or you would like further information on our chair covers for hire please contact us.